It’s hard to believe that November is here, and we’re already prepping our appetites as well as the food for a Thanksgiving Day feast. And, whether you are a novice cook or a seasoned host, everyone deserves a stress-free holiday cooking experience. This year, you can leave a lasting impression on your family and friends without having to endure hours upon hours of preparation. Here are some food prep tips for a free and easy Thanksgiving. The first week of November is the perfect time to shop for all of your must-have ingredients. That way you will have a leg up on grabbing those hard-to-find items. And, more importantly, you can skip the chaos and surge of people frantically searching for their supplies. 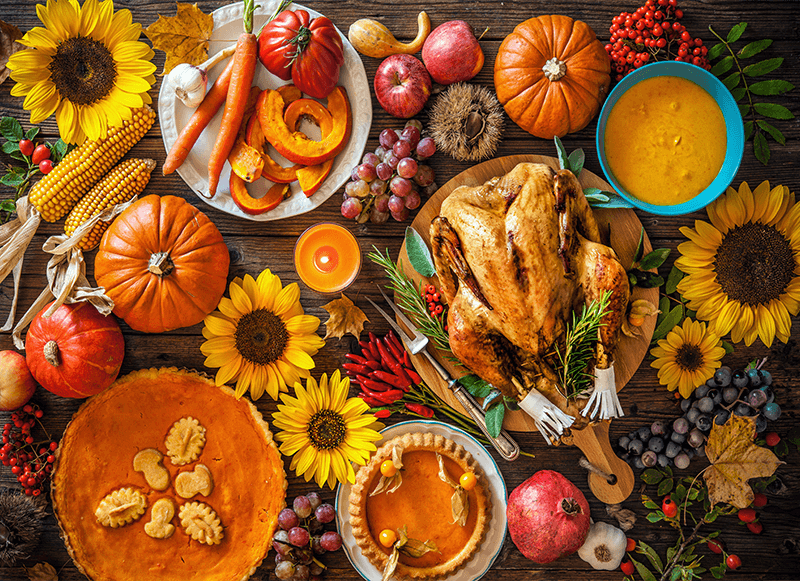 However, remember to stick to the non-perishable items such as decorations, flour, sugar, vegetable oil, casserole toppings, and canned pumpkin. Then, wait until a day or two before Thanksgiving to buy all of your fresh vegetables, fruit, seafood, and bread. One of the best things about pie, among many, is that it’s flexible for freezing and storing in multiple ways. You can make your pie crusts and freeze the discs, roll out the crusts and then freeze right in the pie dish, or completely freeze a whole unbaked pie. Then, directly place the pie or crusts in a large plastic bag and seal it tightly. Now, all you have to do is transfer it to the refrigerator to thaw the night before baking. You can prepare several side dishes (that reheat well) ahead of time to minimize the workload on Thanksgiving Day. Cranberry sauce is actually one of the easiest dishes to prepare in advance. Because it is sugar-based, there will be no change in consistency or taste by making it ahead of time. Another easy dish to prepare in advance is casseroles. The classic green bean casserole (oh, how we’ve missed you) can be assembled and stored tightly wrapped in the refrigerator for up to 3 days. Just top with fried onions before baking. And then, there’s the gravy. Perhaps, one of the most important elements to accompany your Thanksgiving table. You can prepare the gravy by roasting a few turkey pieces to achieve both homemade stock and drippings. You can then reheat it the next day, thus eliminating the stress of making gravy while the turkey is resting and everyone is waiting to eat. We hope that these Thanksgiving food prep tips make your holiday easier and brighter. Have a Happy Thanksgiving Day from our family to yours. May you enjoy it with family and close friends.